'Tis the season to be jolly, but Charlie Brown, feeling that the Christmas message is lost amid all the seasonal glitter, has the blues. Psychiatrist Lucy suggests a cure: get involved with the Christmas play! When our hapless hero sets out to find a Christmas tree to use as a stage prop, he unknowingly takes a step toward discovering the holiday's true meaning. The scraggly tree that thrives on a "little love" and a timely assist from Linus make the message of the season come shining through. Winner of the Emmy and Peabody awards, A Charlie Brown Christmas is digitally mastered for excellent sound and picture quality. Bonus Feature: It's Christmastime Again, Charlie Brown; Snow on the ground, goodwill in the air and - good grief! - another Christmas play to perform! Have fun (and keep an eye out for a sidewalk Santa that looks suspiciously like a bearded beagle)! And here's where it all began! Over the decades, more than 40 Peanuts TV specials and movies have appeared, but 1965’s A Charlie Brown Christmas was the first. It remains arguably the best and it also deserves a spot as one of the all-time great Christmas programs. Brown takes a gentle and non-preachy look at the "real meaning" of Christmas. Even as long ago as 1965, the forces of commercialization had taken over the holiday, and this show makes a mild attempt to reclaim it for its actual purpose. It's well known that many folks get pretty depressed at the holidays, and Charlie Brown is no exception; the festive nature of the period shows him more clearly than ever the problems of his life. He takes on the job of director of a Christmas pageant to boost his emotions, but as with most of his undertakings, it goes awry. How he and the others deal with this is what adds the depth and spark to the production. Brown straddles the line between silly comedy and preachy "message piece". However, it does so quite cleanly and never falls too harshly into one category. Even when we hear Linus read from the Bible, the actions fit the tone of the program and don't become excessively dull or serious. A Charlie Brown Christmas has endured this long for one reason: it's a very solid special that offers pretty much everything you'd want from a Christmas show. All that packed into 25 minutes makes it a taut and concise gem. 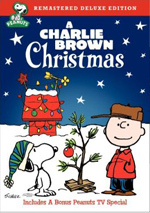 A Charlie Brown Christmas appears in an aspect ratio of 1.33:1 on this single-sided, single-layered DVD; due to those dimensions, the image has not been enhanced for 16X9 televisions. The show looked very good throughout this nice transfer. Sharpness was solid. The show always offered good definition and delineation, without any notable signs of softness. Moiré effects and jagged edges did not present concerns, and I noticed no edge enhancement. Source flaws were moderate. I witnessed some specks and marks, but I thought most of those could be attributed to weak clean-up animation from the source. The transfer still had some messy aspects, but it wasn’t too bad in that regard. Colors fared well. The show’s primary hues looked lively and full throughout the program. At times, the tones really popped, as the transfer reproduced the basic colors nicely. Black levels also look deep and rich, and shadow detail was just fine. Overall, this was a fine presentation given its age and origins. Brown provided relatively satisfying monaural audio. Dialogue sounded clear and crisp, with no edginess or dull qualities. Effects were sporadic and cartoonish but seemed acceptably clean and accurate. Vince Guaraldi's music was fairly lively and even offered some mild bass at times. The overall production showed some thinness commonly found in recordings of the era, but I found it to provide pretty nice sound as a whole. How did the picture and audio of this 2008 “Deluxe Edition” compare to those of the original 2000 release? I thought both offered virtually identical audio, but the 2008 transfer demonstrated improvements. The new image looked cleaner, tighter, brighter and more stable. Actually, the 2000 presentation was perfectly acceptable, but the 2008 version gave us a more satisfying rendition of the show. In terms of extras, we open with the only repeated element from the old disc: 1992's It's Christmastime Again, Charlie Brown, a long-delayed sequel to the 1965 original. Wisely, it doesn't attempt to emulate that classic. Instead, it takes a looser and more glib look at the holiday through a series of minor vignettes. In essence, Again feels sort of like a bunch of comic strips cobbled together into one piece. There's no coherent plot. We find various brief stories that are stuck together in a fairly smooth manner but which don't attempt any kind of overall message or tale; one minute we see Charlie Brown as he tries to sell wreaths, the next finds Snoopy as a street corner Santa. It's all loose and semi-random but fairly fun. Clearly the show's lack of coherence makes it less memorable than the original special, but that doesn't mean it's not a lot of fun. Actually, Again may be one of the more amusing of the Peanuts specials, which surprises me given its recent vintage. Peanuts wasn’t very funny for the last decade or two, and I didn't expect much from a 1992 offering. Despite that possibility, It's Christmastime Again, Charlie Brown functions as a nice complement to the earlier classic. It offers a fun experience that seems rewatchable and clever. The show probably would function best as a "warm-up" to A Charlie Brown Christmas, so you may want to view it first if you decide to take in both during one sitting. Next we find a new 15-minute and 58-second featurette entitled A Christmas Miracle: The Making of A Charlie Brown Christmas. It provides remarks from producer Lee Mendelson, Peanuts historian Scott McGuire, director/animator Bill Melendez, Charles Schulz’s wife Jeannie, former network executive Fred Silverman, and animation writer/historian Mark Evanier. “Miracle” looks at how Peanuts made the leap from the newspaper page to the TV screen, aspects of the special’s development, music, cast and performances, animation and character design, missing scenes and controversies, the network’s initial opinion of the show, and its reception and legacy. Expect a good overview of Christmas here. The featurette’s brevity is an issue, as it flies through the production too quickly; I’d like to hear a lot more, and it’s too bad none of the original child actors pop up here. Nonetheless, we learn a lot about the special in this informative and engaging piece. A few ads open the DVD. We get promos for the Rankin-Bass special Jack Frost, A Charlie Brown Thanksgiving, A Charlie Brown Christmas and the Scooby-Doo interactive DVD Game. Yes, it seems very odd that the DVD includes an ad for itself. The disc also includes trailers for Fred Claus, Looney Tunes Golden Collection Volume 6, Popeye, Smurfs and Scooby-Doo And the Goblin King. The set also includes a Bonus CD. This provides a six song “sampler” of Vince Guaraldi’s music. We find “My Little Drum”, “Linus and Lucy”, “Hark, the Herald Angels Sing”, “Christmas Is Coming”, “Fur Elise” and “Greensleeves”. More dedicated fans of Guaraldi’s work will want a broader compilation of his Peanuts music, but this acts as a nice add-on for the rest of us. While I also liked the It's the Great Pumpkin, Charlie Brown disc, this package probably offers the best of the Peanuts shows. A Charlie Brown Christmas remains a classic after more than 40 years. Picture and audio are perfectly acceptable, and we get some nice extras. This is a memorable special and a pretty good DVD. Note that this DVD also can be purchased in a boxed set called “The Peanuts Deluxe Holiday Collection”. That package also includes It's the Great Pumpkin, Charlie Brown and A Charlie Brown Thanksgiving and it lists for $44.76. That almost makes it a “two for the price of one” package. Since all three specials are good, the “Collection” offers a nice bargain.